Definition at line 482 of file llvosky.h. Definition at line 492 of file llvosky.h. Definition at line 366 of file llvosky.cpp. References mHeights, mTransp, and NULL. Definition at line 829 of file llvosky.h. References LLTranspMap::calcAirTransp(), lerp(), mTransp, NO_STEPS, and S32. Definition at line 857 of file llvosky.h. Definition at line 501 of file llvosky.h. Definition at line 499 of file llvosky.h. Definition at line 498 of file llvosky.h. Definition at line 500 of file llvosky.h. Definition at line 497 of file llvosky.h. Definition at line 496 of file llvosky.h. Definition at line 338 of file llvosky.cpp. 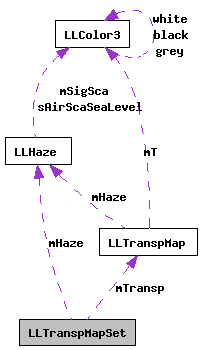 References LLTranspMap::init(), mHeights, mMediaHeight, mSize, mTransp, s, and S32. Definition at line 502 of file llvosky.h. Definition at line 888 of file llvosky.h. References getLastHeight(), mHeights, and S32. Definition at line 489 of file llvosky.h. Definition at line 485 of file llvosky.h. Referenced by getHeight(), getLastHeight(), init(), lerp(), and ~LLTranspMapSet(). Definition at line 488 of file llvosky.h. Referenced by getMediaHeight(), and init(). Definition at line 487 of file llvosky.h. Referenced by getLastHeight(), getLastTransp(), getSize(), and init(). Definition at line 486 of file llvosky.h. Referenced by calcTransp(), getLastTransp(), getMap(), init(), isReady(), and ~LLTranspMapSet().